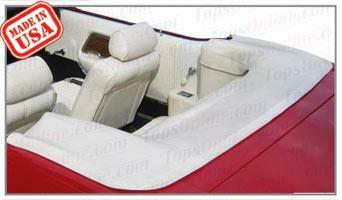 This Mustang Convertible Top for the Ford Mustang & Mustang GT fits the 1969 thru 1970 model years. Padded Boot Cover attaches with Snaps & Slip Tab, Snaps included and already installed on the cover. Made with original Corinthian textured expanded Vinyl material. I've installed the top I purchased from your company and I must say that I'm very impressed with the workmanship. The fit is excellent and the instructions were most helpful. Thanks again and I will certainly recommend your business to my friends who are looking for a new top.